Easy to install. Powerfull to use. have a management software that will make it easy. and RFID readers that you want to use. There is no need to be limited. Just let us know. The SH4 system comes with free SW to help you manage everything from one place - users, doors, groups, locations, the whole lot. The SH4 is a system of devices ranging from a unit supporting 2 RFID readers to a simple door unlocker. Pay just for what you need and the system will grow with your requirements. 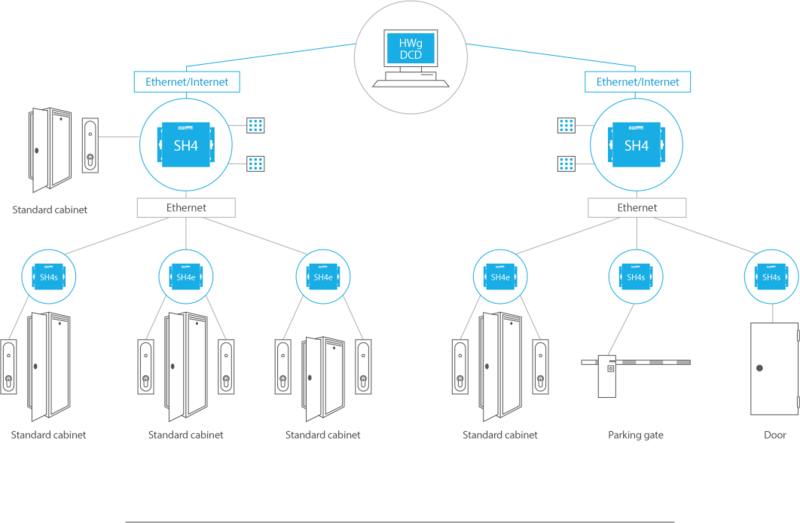 Though it‘s designed with IT need in mind, the SH4 system is not limited to datacenters. Whether you need to control access to an office house, remote telecom cabinets or a residential area, the SH4 provides a simple and secure access control for any application. Each SH4 device can connect up to 2 electromagnetic locks and 2 RFID readers of your choice. There are many locks and RFID readers on the market. The SH4 already supports the most common models and others can be added upon request. 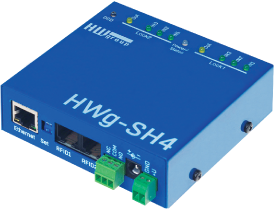 The SH4 features a relay output that can be programmed to mark a door open in a rack row or to trigger an alarm in case of a breach. In offline mode the SH4 can work as a standalone device that holds an internal database of cards and users. You just need the Ethernet port to setup the unit and the device will follow the access rules without the need for LAN connection. In online mode the device is connected with a server running the HWg-DCD software. This server manages all the access rules. The relevant part of the entire user database is loaded in each SH4 so that you can still access your technology even if your network connectivity fails. Wherever you do not need an RFID reader, you can expand your system with the SH4e and SH4s units. Controlled from a supervising SH4 unit and its RFID keypad, the SH4e and SH4s units are simple unlockers for 1 or 2 electromagnetic locks. You can grow your access system as needed and keep the implementations costs low. The SH4 units are manufactured by HW-group in the Czech Republic in compliance with the strict quality rules of the European Union. All devices are CE certified and quality tested. and infractructures all over the world. HW-group has a worldwide network of distributors ready to help you with your project. All our partners are trained to provide you with the best possible local support. We have helped the following companies with their monitoring or access solutions. We would be thrilled if you were the next.